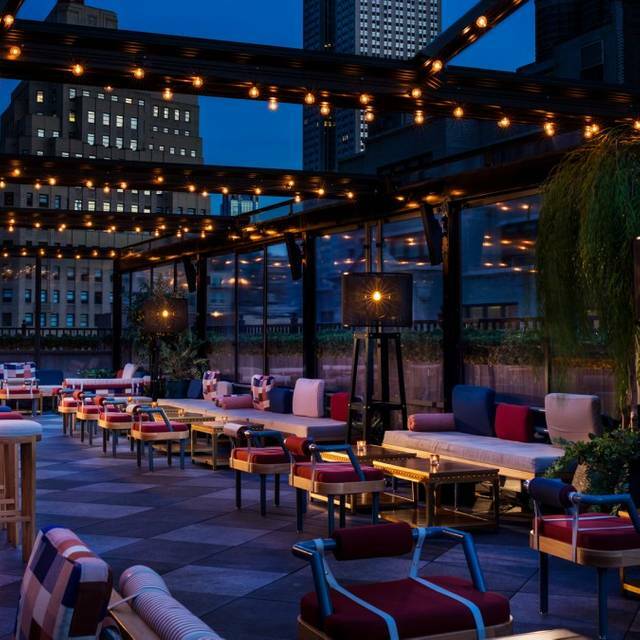 New York City’s largest indoor/outdoor hotel rooftop bar and lounge features an “urban amusement park” concept with an adult sensibility and offers epic Empire State Building skyline views. 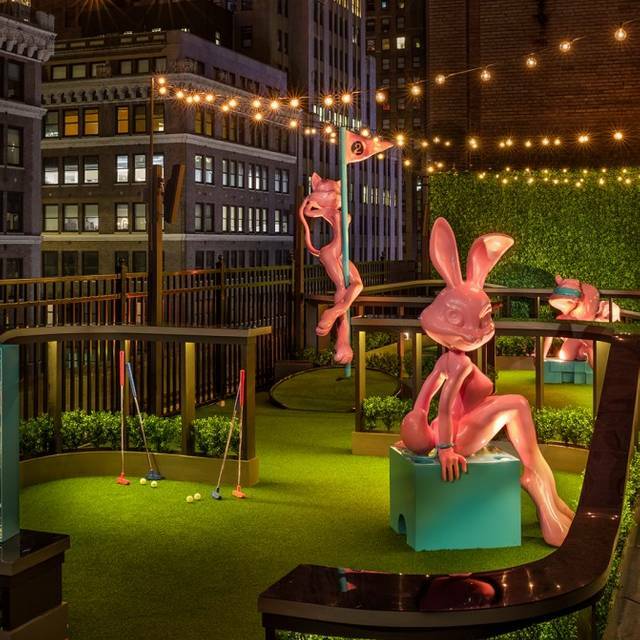 Highlights include carousel seating, oversize topiary gardens, and Foreplay, a miniature putt-putt featuring life-size animals in flirty poses. 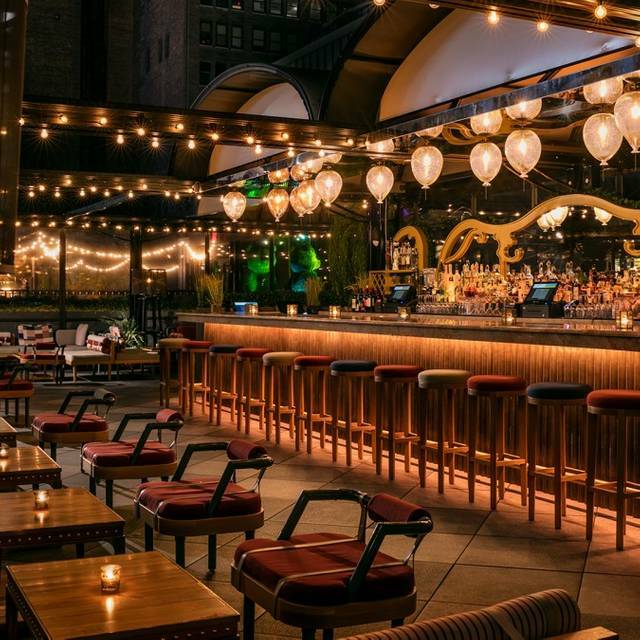 The vast, all-season rooftop lounge comprises multiple bars and seating areas, each with a distinct vibe and design sensibility to provide an endless stream of indelible “moments.” A menu of shareable light bites is rooted in the world of the state fair, with modern takes on classics including Maine Lobster Roll, Magic Hour Sliders, and Cracker Jacks. 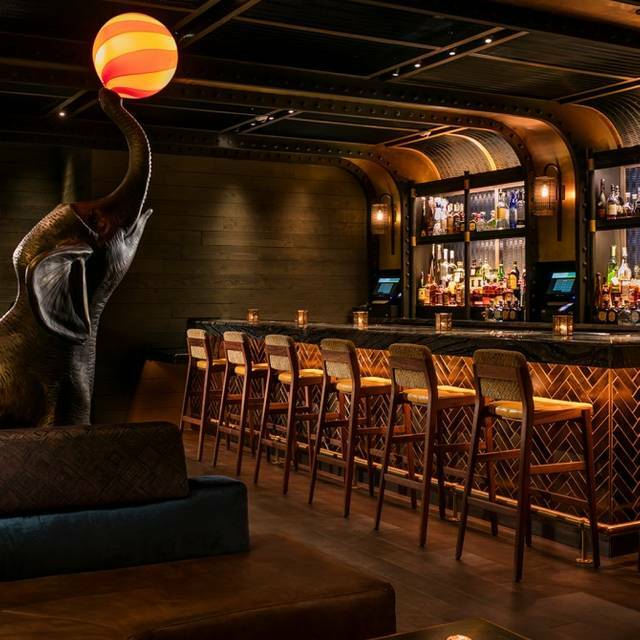 Live DJs and a list of decadent cocktails and large format “curiosities”, interactive cocktails with unique presentations for groups —along with beer, wine, Champagne, and spirits—add to the sense of indulgence and amusement. Bottle of Magique Cremant de Bourgogne Brut, Fresh Orange Juice. Make your own Mimosa! Just what we were looking for to celebrate our anniversary. Kind of expensive but a great experience, loved the pancakes! I was very impressed with the place. I loved how it looked like we were going into an exclusive club from the outside entrance. The food was fantastic! loved the pancakes was so amazing the energy was great the music was good. deinfitely coming back here in the summer. I would recommend this place to all my friends ! This restaurant was amazing! So beautiful and the food was fantastic! Loved the mini golf!!!! Went to Magic Hour for brunch. Maybe it has more appeal at night, because during the day it was nothing special. The food was decent and priced adequately for the area. However service was TERRIBLE... we were never checked on, not even once. We had to go up to the bar just to request our check. There’s so many other rooftops in the area, I’d pass on coming back here. Fabulous fabulous fabulous. ! We went over the weekend. We had a great time. Our waitress was awesome! It was my birthday so we had the boozy cupcakes and they put a big sparkler in it !!! The cocktails were great. And the cotton candy pancakes were the cutest thing over ever seen!! I went for a brunch/lunch and had a great time on the carousel. Magic Hour was the perfect place for my birthday! The drinks were a little expensive, but they were all worth it. The food was amazing as well!! Highly recommend and would love to come back again! Fabulous and friendly with one of the best drink menus out there. The experience was great and the food was delicious! The didn’t have our reservations saved, they said they would add us to the list and forgot. We decided to wait by the bar, and eventually had to go back and remind them. Rather disappointed- this is not a brunch environment but I'm sure a fun club. The food was adequate but did not match the price as far as quality and substance. Great place and great service, would definitely go again. Food was good. Service and drinks sub par. The food was delicious, the staff was very pleasant, the drinks were very strong. It was a really fun atmosphere as well. Such a cool place and the food was great!!! Food was okay, had to have our seat moved due to large amount of flies. Prices are HIGH and service was not the best. Went for bubble brunch only to be told it would not be happening on the day of our visit- disappointing. Our waiter Josh was incredible and made the best recommendations! (Party pouch and diplomat for drinks, midtown (?) for food). Overall a great experience! We went for brunch and stayed for drinks and photo ops (seriously). There is a lot to look at in this space--from the merry go round seating to the Fore Play mini golf area, you definitely won't be bored. The food and drinks are fun as well. We started with the watermelon salad, which was plenty for two given the entree portions. I had the @Egghead, which comes with a sizeable helping of breakfast potatoes. My husband had the french toast and a side of eggs. I had a mimosa but wanted grapefruit juice instead of the traditional orange. The bartender was happy to accommodate me and my husband tried a 2 different drinks. He liked the Paloma. Overall, we had a great time eating and people watching. As a note, there is a DJ during brunch. We loved that but if you are looking for quiet conversation, this isn't the best option for you. So much fun! The bartenders are great! The food was delicious! Got the avocado toast and the breakfast sandwich. Sounds odd but the breakfast sandwich was delicious!!! Drinks were delicious, DJ was excellent too.